China's President Xi Jinping and Afghan Chief Executive Officer Abdullah Abdullah shake hands during their meeting at the Great Hall of the People in Beijing, China, May 17, 2016. The NUG leadership saw China as a useful figure in these efforts due to four factors: China’s “very special” relationship with Pakistan; Beijing’s concerns over the “three evils” (separatism, terrorism and extremism) as well as drug trafficking; evolving Chinese interests under Belt and Road Initiative (BRI); and China’s increasing ties with the Afghan Taliban. To influence and persuade both China and Pakistan, the NUG did three things just after its formation. First, it changed its foreign policy in the light of the 2014 U.S. drawdown of troops. The NUG’s new foreign outlook is based on a doctrine of “five circles,” wherein the first circle includes increased engagement with neighbors (the Islamic world, Western allies, Asian countries, and international organizations make up the other “circles”). Hence, Ghani visited China on his first foreign trip as president and then visited Pakistan before visiting either Iran or India. Second, the NUG arrested and handed over Uyghur extremists to China and Pakistan Tehreek-e-Taliban leader Latifullah Mehsud to Pakistan. Third, the NUG stepped up its outreach to Pakistan in ways unprecedented in bilateral history. That includes sending Afghan military personnel to Pakistan for training; a memorandum of understanding between the two countries’ intelligence agencies; and limiting Indo-Afghan ties (Ghani did not visit India for seven months after becoming a president and suspended Afghan requests for heavy Indian artillery). Shortly thereafter, Pakistan and China arranged a meeting between three representatives of the Afghan Taliban and members of the Afghan High Peace Council at Urumqi, China on May 19. It is reported that the former Taliban leader Mullah Mansoor even endorsed this meeting due to Pakistani pressure, but the idea was then rejected by the Taliban political office in Qatar. Although it is considered the first face-to-face talks between the Afghan government and the Afghan Taliban, it didn’t pave the way for another meeting as agreed, much less a final peace deal. Two factors prevented a more successful outcome: First, the news about the death of Mullah Omar leaked, and it was not possible for the then-Taliban leader, Mullah Mansoor, to continue a peace process. Instead, he focused on re-establishing his authority and securing allegiance oaths from Taliban followers. Second, from the Taliban’s perspective, Mullah Mansoor agreed with Pakistan to enter into the talks only if the news of the meeting was not made public. After the Murree Talks, the Afghan peace process stalled. A bloody wave of bomb blasts jolted Kabul, while at the same time Kunduz, the sixth biggest city in Afghanistan, fell temporarily into Taliban hands. Both incidents impacted bilateral Afghanistan-Pakistan ties. The Chinese side, along with the UN and United States, once again played a role here through regular visits by Chinese officials to Pakistan and Afghanistan. In the aftermath of Li’s visit, Deng Xijun, China’s special envoy to Afghanistan, also visited Islamabad and Kabul. During his visit to Kabul, he said that China supports peace talks between the Afghan government and the Taliban and is ready to facilitate the peace process. Deng noted that peace in Afghanistan is vital for China too and promised that he would once again visit both countries in one month. That didn’t happen, however. Instead, Ghani met the Pakistani prime minister on the sidelines of the Paris Climate Conference and accepted the Pakistani proposal for a quadrilateral grouping bringing together Afghanistan, Pakistan, China and the United States. The first Quadrilateral Cooperation Group (QCG) on the Afghan peace and reconciliation process was held in Islamabad on January 11, 2016, on the sidelines of the fifth conference of the Heart of Asia-Istanbul Process in Islamabad. In its first meeting, the QCG called the ongoing violence in Afghanistan “senseless” and identified an “immediate need” for direct talks between the Afghan government and Taliban representatives. In the third meeting, a target was set for talks to be held in late February 2016; in the fourth meeting the deadline was extended. The Afghan government welcomed this development and was “deeply grateful to the United States and China for their continued support.” However, in the end, the Taliban’s statement rejecting participation in the QCG shattered hopes for peace talks. Later, when direct talks were still not forthcoming after the fourth meeting of the QCG, Abdullah visited China on May 15-18, 2016, where he met the top Chinese leadership. In his meetings with Chinese President Xi Jinping, Prime Minister Li Keqiang, Vice President Li Yuanchao, and Head of Foreign Relations of the Communist Party Sun Tao, Abdullah iterated the same requests: That China persuade Pakistan to sincerely help in the Afghan peace process and assist Afghan security forces. 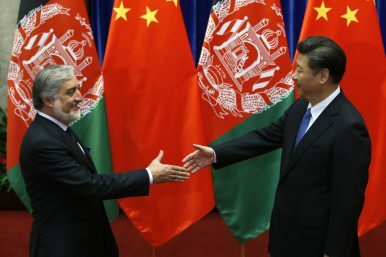 Abdullah told Xi that the Quadrilateral Cooperation Group had fallen short of expectations, but said Kabul was still thankful for the Chinese efforts in this regard. He further said, “Afghanistan hopes that China will take its regional influences and would coordinate in a fight against terrorism and would persuade the regional countries to sincerely, fully assist and support the Afghan peace process.” Abdullah also noted that to defeat terrorists it is essential to assist Afghan security forces militarily. Though in this meeting Xi did not say that China would persuade Islamabad, he did say that Beijing fully supports the Afghan-led and Afghan-owned peace process and Kabul’s request to become a full member of the Shanghai Cooperation Organization, and is ready to equip and support Afghan security forces. In 2017 and again in 2018, Abduallah requested Chinese assistance in persuading Pakistan to cooperate with Afghanistan in the Afghan peace process. On June 24, 2017 Abdullah told Chinese Foreign Minister Wang Yi that he hopes “China would use its good relations with Pakistan to improve relations between the two countries and fight against terrorism.” He made a similar request in another meeting on December 15, 2018. However, the Chinese official account of these meetings does not mention Abdullah asking China to put more pressure on Pakistan. Under the NUG, Beijing’s response to Afghan requests has varied. It regularly condemns suicide attacks and has been providing economic assistance, supporting Afghan bids for full membership in the SCO and Asian Infrastructure Investment Bank (AIIB), as well as its inclusion in the BRI. In regards to Afghan requests, China is showing more readiness to play a role, facilitating the Urumqi talks and taking part in the Murree and QCG talks. Also, for the first time in Sino-Afghan bilateral history, China provided military assistance to the Afghan Security Forces worth 480 million yen ($73 million), and even asked Afghan officials to provide a military wish list to China. Recently, Beijing has shown readiness to provide material and technical support for the establishment of a mountain military brigade in the Afghan Wakhan mountainous area. With regards to the Afghan peace process, China is more interested in a multilateral approach and believes that the peace in Afghanistan correlates with warm Afghanistan-Pakistan relations. Chinese Prime Minister Li Keqiang once told Abdullah that “peace and stability in Afghanistan were dependent on having good relations with Pakistan and Pakistan’s cooperation in this regard.” Hence China has preferred to act as a mediator between Afghanistan and Pakistan, including having arranged trilateral meetings between the three foreign ministers. Yet even increased Chinese engagement has not led to sustained talks between the Afghan government and the Taliban, much less a final peace deal. The “China card” played by so many Afghan governments through the decades may be less of a trump card than long envisioned. The author is thankful to Halimullah Kousary, the acting director of Conflict and Peace Studies, and Borhan Osman of International Crisis Group for reading the first draft and their comments.